This USB extender uses inexpensive CAT5/5e/6 patch cable to extend the range of your USB peripherals. Plug a length of patch cable (up to 198 feet long) into the remote and local units, and then connect your self-powered USB device. 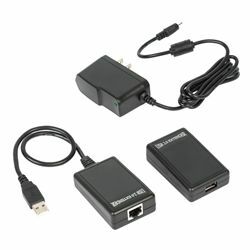 You'll have a reliable, wired connection to your USB peripherals from your PC with no signal loss. Now your Web camera, scanner or printer doesn't need to be next to or even near your computer. RJ-45 cable not included. Please note, only compatible with USB 2.0/1.1 devices.